i am on record, somewhere or other, as defining sheep as predictably the most unpredictable animals on earth. they are allowed to roam free in the fields that edge uiskentuie strand and seem almost incapable of distinguishing between grass and tarmac. thus when approached by an incoming bicycle (or motor car, for that matter), something unpredictable is going to happen; the trick is in figuring out what. there's a a short stretch of singletrack road between the rspb farm at aoradh and loch gorm, the second part of which scurries downhill for a kilometre or so. it is edged on both sides by a few scraggly bushes of indeterminate origin, behind which sheep are inclined to conceal themselves. if that were all they did, cycling life would be so much more agreeable, but right down to the last strand of wool, they have a predilection for running towards moving bicycle wheels just at the moment when the rider is powerless to avoid them. however, sheep are not the only inhabitants of the hebrides that display suicidal tendencies, but my second example verges on undermining all that charles darwin worked for. pheasants are of multiple numbers round these here parts; the males are bright and varied of colour, while the females are of an altogether less flamboyant hue. in fact, it wouldn't be overstating the case to describe the latter as dowdy. however, rather than criticise, the muted browns of the female pheasant are most likely designed as the ultimate in camouflage, hiding them from predators particularly when sitting on the nest. sadly, they seem blissfully unaware of this. no matter where or how well the females of the species have concealed themselves amongst the undergrowth, on becoming aware of an approaching bicycle, they are wont to fly up from their hiding places either into the path of said cyclist or off into the hinterlands. this despite the fact that up until that point, they were totally hidden fom view. i realise that pheasants know little of mirrors and thus have no idea of their inherent camouflage, but should not evolution have taught them otherwise? 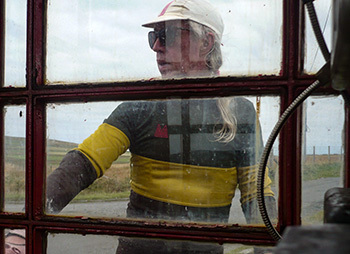 this sense of camouflage, if i may be so bold to describe it thus, has inflected rapha's latest and quite possibly finest jersey offering to date. commissioned to celebrate the 1909 tour of lombardy, the latest edition of which took place today, the jersey not only reflects the colours you'd expect to be associated with the race of the falling leaves, but the rich heritage 109 editions would suggest. thus the three strata in descending order are bottle green, antique gold/ochre and what i like to describe as espresso, perhaps for obvious reasons. given the autumnal colours affecting the various peat mosses around the island, were it to constitute seemly behaviour in cleated shoes, i could stand midst any one of these and you'd never see me. 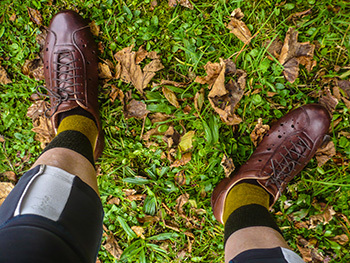 talking of those cleated shoes, when wearing the lombardia jersey, there really is no option but to don a pair of dromarti leather lace-ups. i say this because the jersey can be matched with a similarly coloured pair of thick, woolly socks. 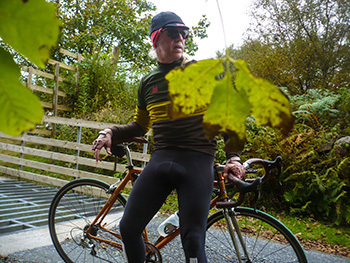 with burgundy leather, you'd have easily mistaken me for giovanni manina cuniolo, one of the principal protagonists in that 1909 giro di lombardia. assisting with this historical context is the means of fastening the jersey at the neck. for in 1909, the zip, though already partially invented had not yet begun to feature on race jerseys. 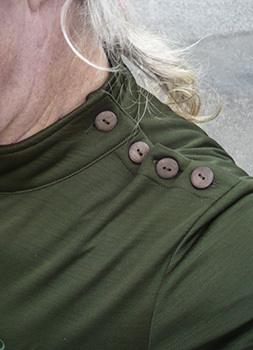 thus this tribute to the past features four wooden (yes, i kid you not; real wood) buttons starting at the top of the collar and spread across the left shoulder. i'd be fibbing if i denied this not to be a bit of a faff to open and close each time the jersey has to be worn or removed, but the end justifies the means. 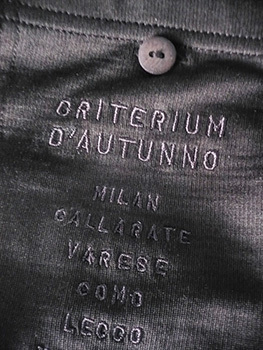 it's a tall sportwool collar and fastened with buttons brought me even closer to being identified as cuniolo. there are three more wooden buttons featured atop the three pockets at the back, possibly more for effect than pragmatism, for i doubt many of us are too adept these days at flipping a button open to grab an energy bar. aside from which, on stepping out, i'd pretty much filled each pocket, so the buttons were already unfastened. i cannot deny that i'd rather the centre pocket were a smidgeon larger. i like to place my waterproof jacket in that particular location, but in truth, it's just a bit too narrow to accommodate a rolled up race cape. but in mitigation of its small size, that middle pocket is embroidered with details recalling the 1909 race route. and that's not the sole example of embroidery on the jersey; there are various manina motifs and insignias, that combine to make this a particularly collectable edifice. i'm willing to bet that in ten years' time, the lombardia jersey will look even better than it does right now. and lest you think no cycle jersey would ever last that long, i currently own a pink mortirolo rapha jersey that i purchased in 2005. you'd honestly think i'd bought it yesterday. 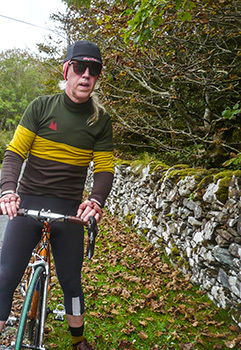 rapha portend that it is every bit as suited to training rides as it is worn as casual wear, a sentiment with which i find it hard to disagree, though in view of rapha's eternally impeccable fit, you might want to move up a size if you intend to laze about supping froth and eating carrot cake all day. that way, the jersey will be every bit as relaxed as yourself. i know i'm perennially reiterating my love of long sleeves, so that particular box receives a thick, black tick, but sportwool, in my book, equates to hard-wearing luxury. in view of the delectable colour scheme, one that attracted enviable glances and more than just a lone compliment as i devoured my double-egg roll on saturday lunchtime, it has achieved favourite status in a remarkably short time. as to the socks, these are scarcely your average velocipedinal footwear. 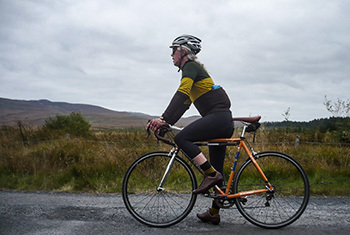 constructed from a thicker merino-based yarn than we have become used to, with padded toe sections, they're not only the ideal complement to the jersey, but just ginger peachy on cooler autumnal days such as those that have already appeared in the hebrides. and though rapha could scarcely have had it under consideration, they also matched my burgundy dromarti leather quite impeccably. the price of £160 ($240) may bring one or two tears to those thighs, but in the light of the style, collectability and detail applied it really doesn't seem too onerous an outlay. if it does indeed last those ten prophesied years, that's only £16 per year, which is actually pretty cheap. rapha's giro lombardia jersey is available in sizes ranging from xs to xxl at the aforementioned £160 ($240). the socks can be acquired in small, medium, large and extra large for a mere £15 ($25).